Moabit is a not yet gentrified district in Berlin. As a former working class neighborhood it is not yet a scene district and offers a lot of insider spots. You will find quite outdoor locations, nice restaurants, the best spa in Berlin and several historic places. To discover Moabit, I teamed up with Tai to create the perfect conscious getaway in this beautiful district full of surprises. The BerTaiBerlin map of Moabit will be published in March, until then you can preorder it in my shop and read through some of our recommendations in this article. 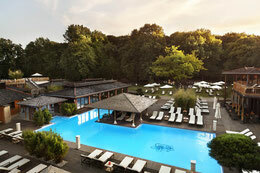 Probably one of the most beautiful spas in Germany. Vabali Spa offers a unique Far Eastern atmosphere on 20 thousand square meters. Find peace and quietness in the big city! Have a drink at the chimney, a swim in the outdoor pool or try a phenomenal infusion with a coconut peeling in one of the saunas. And no worries if you get hungry- the sweet potato fries and the melon-avocado salad among other great options will make you happy! If you are interested in getting a massage you rather book in advance. The purpose of Braun Design Freunde e.V. is the archiving, collection and presentation of all products manufactured by Braun. Innovative, aesthetic, useful: A visit to Werner Ettel's Braun collection is a reminiscence of an early start-up culture. The collection presents its classics devoted to the history of the well-formed objects from 1955 to the present day. In addition to the products as such - from the Braun door handle over the television set all the way to the famous Braun electronic shaver, almost everything that Braun produced back in the day is available - the collection offers insights into a deeply utopian chapter of German industrial design and how it influenced Steve Jobs for the design of his Apple company and products such as the iPod. The entrance fee is by donation, they offer a guided tour by Ettel himself on Monday at 14:00. Probably the biggest and most impressive collection of special cars in one spot. Not only for old timer lovers! 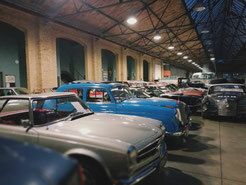 Housed in a refurbished former tram depot Classic Remise is packed with Maseratis, Ferraris, Bentleys, Lamborghinis. A few special whips you can look out for are the two La Ferraris, two Dino Ferraris, an old timer SLR and a Lancia Stratos in bright green. This automotive booty is not a museum, but a rather impressive service centre so entry is free. Most of the iconic cars on show are privately owned. Refuelling options for visitors are provided by an on-site restaurant and café too with a pretty good barista. One of the best spot to have a dinner in Moabit! 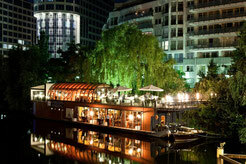 The ship restaurant is located on the river Spree with a fantastic view and great food. In summer you can enjoy the beautiful sunset drinking wine on the deck, in winter you try the cosy room downstairs. This restaurant will impress you with a menu you won’t forget. Try the tuna tataki and the corn chicken served with chorizo. BON APPETIT. Explore a new exciting concept of self brewed beer and self created cocktails and drinks in Moabit. The owners place great value on best quality bavareges and refrain from comercial liquors. With every beer you order you support a family establishment and the preservation of local breweries. 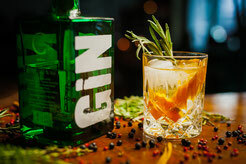 Must try: THE new creation of Negroni.